What Features Make Lazur Technology Unique? The Lazur water treatment system is state of the art technology that originated from technology developed for military applications. It uses the simultaneous application of ultra-violet radiation, ultra-sonics and acoustic vibration for the complete deactivation and elimination of pathogens in water. 1. 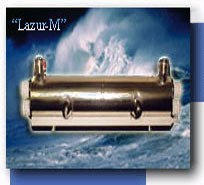 Lazur technology is unique in that the Ultraviolet treatment applied to water uses both short wavelength (253.7 nm) and vacuum Ultraviolet radiation (185 nm), which achieves virtually complete disinfection (up 99.999 %) by killing bacteria and viruses in numbers unachievable in traditional technologies. Conventional technologies use longer wavelength Ultraviolet radiation and ozone oxidation that consumes 3-4 times more energy than Lazur technology. 2. Lazur units are completely free from biological and mineral build-up. 3. The simultaneous application of Ultraviolet radiation, ultrasonics and acoustic vibration in water produces powerful oxidants that are uniformly distributed in the water volume. This boosts the effectiveness of Lazur technology 1000-fold over conventional systems and allows the complete elimination (by complete photo-chemical oxidation) of all micro-organisms (including spores), viruses and protozoa at initial concentrations of up to 106 units/litre. In traditional Ultraviolet technologies (where exposure times are shorter than 1.5 seconds) and high output systems with ozone treatment are not capable of eliminating these types of pathogens. Traditional Ultraviolet and ozone treatment technologies are only effective at very low concentrations of spores and protozoa in water (around one in a litre), and at lengthy exposures. 4. Power consumption per m3/hour of treated water does not exceed 5-8 W for drinking water and 15-20 W for waste water. Our technology has been used over the last three years at industrial and agricultural sites, water treatment plants, water reservoirs and swimming pools in Russia, United Kingdom, New Zealand, South Africa, Angola, Singapore and South Korea. The Units have also been tested in South Africa and New Zealand. All our Units are environmentally safe and certified for spores, viruses, protozoa and bacteria (up to 106 units/litre). The certification trial results are set out in official reports of Accredited Microbiological Centres.